On the third Saturday and Sunday of each July, Venice celebrates the Redentore Festival, or Festa del Redentore. Venetians also refer to the festival as “The Famous Night of Fireworks.” Still another reference to the festival is known as Redeemer Day. Whatever one would call it, this wonderful Venetian festival signifies the end of the1557 plague in Venice and is deemed as one of the most disastrous plagues in Venetian history. 50,000 Venetians died from this plague, including the famous Italian painter, Tiziano Vecellio. It is also the oldest, most consistently celebrated festival in Venetian history. 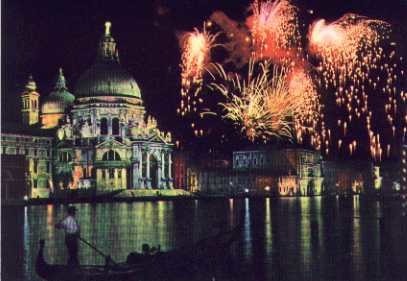 The Festa del Redentore, or Redeemer Day, features vivid pyrotechnics displayed over the water. The fireworks take place the night prior to the Redentore Festival amidst decorated Venetian boats where visitors and residents can dine. 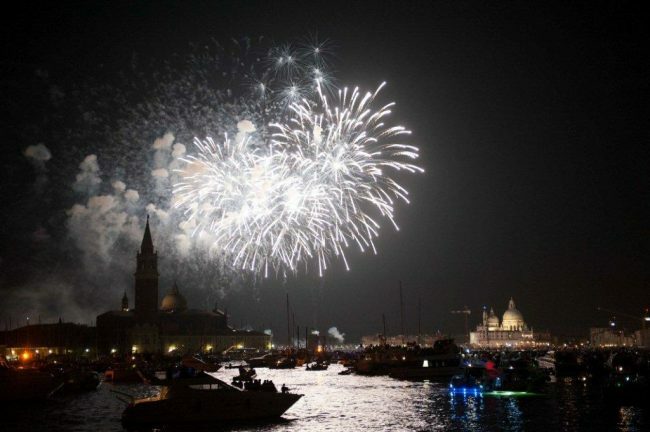 Venetians also admire the fireworks from their decorated wooden terraces and on rooftops. The Zattere, which denotes “raft” in Italian, dates back to 1519 (before the plague) when it was first constructed as a landing dock for timber delivery and ship and building construction. The spacious waterfront walkway is adjacent to the southern shore from the Marittima and San Basilio on to the Punta della Dogana. The Island of Giudeca is directly south. The splendid Redentore Church and Giudeca Island are clearly visible while walking along the Zattere. Andrea Palladio was commissioned to build the majestic church on the Island of Giudecca. Whilst the first stone of the church was laid, a temporary wooden church was erected on the third Sunday of July. A long, floating walkway united San Marco Square and the Giudecca Island (from the Zattere) which was built on hundreds of pontoons. In the 16th Century, the Doge and local dignitaries led survivors along the walkway to give thanks to the end of the plague at the temporary church. Each year (and for centuries—in fact, to present day), army barge bridges have been built between Guidecca Island and the Zattere for the Redentore Festival. The centuries-old solemn yet majestic Venetian church built in honor of the end of the horrific plague is known as the II Redentore. As time went on, the processions to the Redentore Church lessened and they were replaced by less somber activities like the Festa del Redentore. Typical with all popular Venice festivals, the traditional activities of the Redentore include street markets which sell local Venetian foods and fresh produce, and a charity raffle run by the Redentore Church patronage. These take place beginning on the third Sunday morning on Giudecca Island near the famed church. And any traditional Venice festival would not be a true celebration without a regatta, which is comprised of Venetian rowing races that are held along the Giudecca Canal, also on that third Sunday morning of July. Religious celebrations are held throughout the day during the Redentore Festival in Venice.